Effective against clear lines and thin, saggy skin around the neck and décolleté. 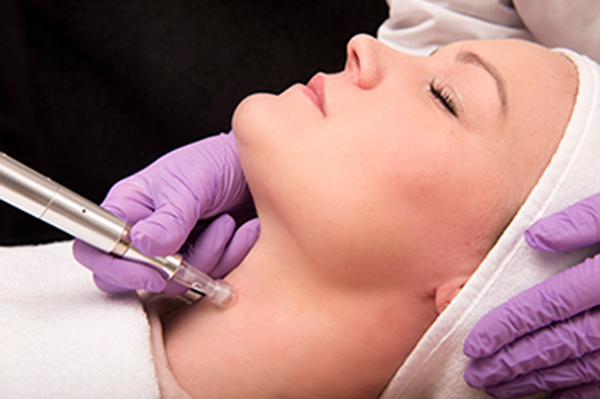 MESO NECK & DÉCOLLETÉE LIFT is an effective method to achieve firm, healthy skin. It is a non-greasy meso product for the facial area, which reduces wrinkles and, e.g. can be used to firm the skin on the neck area. The treatment is completely harmless and without side effects, and therefore is an excellent alternative to other treatments such as Botox. MESO NECK & DÉCOLLETÉE LIFT contains three important ingredients that are the key to achieving a successful, wrinkle-reducing result. 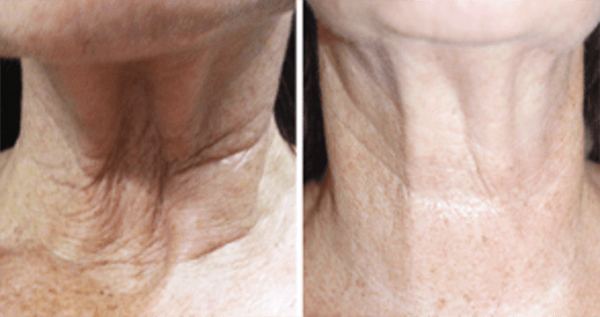 MESO NECK & DÉCOLLETÉE LIFT is the first product to combine DMAE, elastin and methylsilanol, making it the most advanced wrinkle-reducing meso skincare product on the market today. The significant elasticity is due to the protein’s complex composition of cross-linked peptide chains. Parts of them fold in a way that enables the molecule to stretch 50-80% and still return to its original position. MESO NECK & DÉCOLLETÉE LIFT mainly comprises amino acids, glycine, valine, alanine and proline. This is a specialised protein with a hefty molecular weight of 64 to 66 kDa. As we age, the amount of elastin in our tissue reduces, and the skin loses its elasticity. With the right content of elastic, MESO NECK & DÉCOLLETÉE LIFT regenerates and rebuilds the skin elasticity and makes it look younger and firmer. Dimethylaminoethanol, also known as DMAE or dimethylethanolamine, is an organic substance and an important antioxidant in the cellular plasma membrane. It is a precursor, which means a connection that forms another, in this case acetylcholine. Acetylcholine is a neuro transmitter that allows the passage of stimuli between the nerves and muscles. When applied to the skin, it has a firming effect as it stimulates muscle contraction. DMAE trials show that the substance makes skin firmer; firming the skin around the eyes and lips and also giving a defined contour of the face, including a firmer neck and jawline. In vitro testing reveals that applying DMAE results in a significant swelling of the body’s most important connective tissue, fibroblast. The swelling occurs in the vacuoles, which acts as a cellular reservoir. Some believe that DMAE is Botox in a cream form, but this is far from the truth. DMAE has the exact opposite effect, because DMAE stimulates the muscles, whereas Botox blocks and paralyses them. That’s why DMAE is not recommended for deep wrinkles between the eyebrows, but is an effective agent against sagging skin and for firming the skin around the neck. Methylsilanol mannuronate is an organic connection derived from seaweed. The seaweed plant is known for its detoxing properties, and methylsilanol mannuronate acts as an antioxidant that prevents the early signs of ageing. Methylsilanol mannuronate has long-lasting, moisturising properties that fight the breakdown of collagen and elastin fibers. That's why it has a firming effect on the skin. The connection is also known to fight free radicals. In vitro testing shows that methylsilanol mannuronate normalises the cell’s metabolism, is regenerating on the tissue and helps reduce orange peel skin without any side effects. Methylsilanol mannuronate is a safe and natural ingredient used in skincare products, and The Environmental Working Group has declared the connection as 100% safe for cosmetic use. The combination of DMAE, elastin and methylsilanol mannuronate makes MESO NECK & DECOLLETE LIFT a unique treatment for reducing wrinkles and firming the neck and jawline. Elastin is a highly specialized elastic protein which is found in the connective tissue of the skin and blood vessels. Elastin is also an important load-bearing tissue and used in places where mechanical energy is required to be stored. Revitalizes, nourishes and moisturizes the skin and reduces the appearance of wrinkles and fine lines. Gives skin and hair a protective layer.